Marty Brennaman at a Reds Hot Stove League broadcast in 2016. 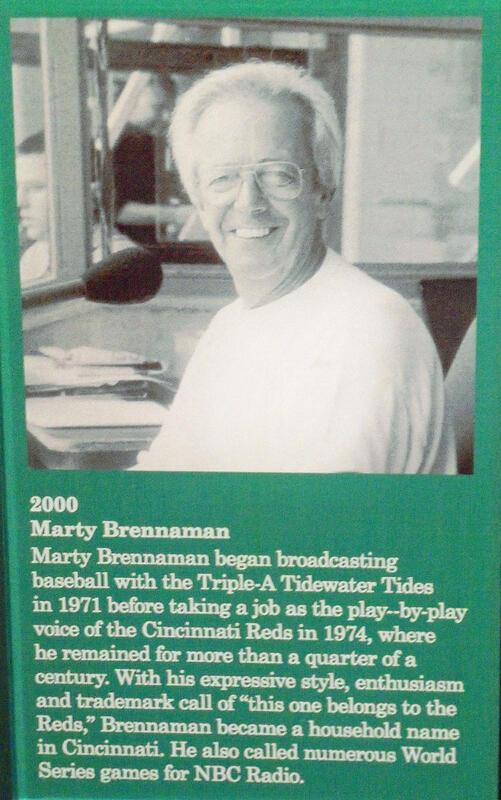 We knew this day was coming, and it's here: Marty Brennaman announced at the annual Reds Radio Network affiliates lunch today that this will be his final season broadcasting Reds games. At least he told us before the season, until waiting until it was over, as he had said many times. Brennaman, who turns 77 in July, revealed his decision to retire after 46 seasons on the eve of the Reds promotional caravan through Ohio, Kentucky, Indiana and West Virginia. The Reds 150th anniversary season will be the last we'll hear him say, "And this one belongs to the Reds." 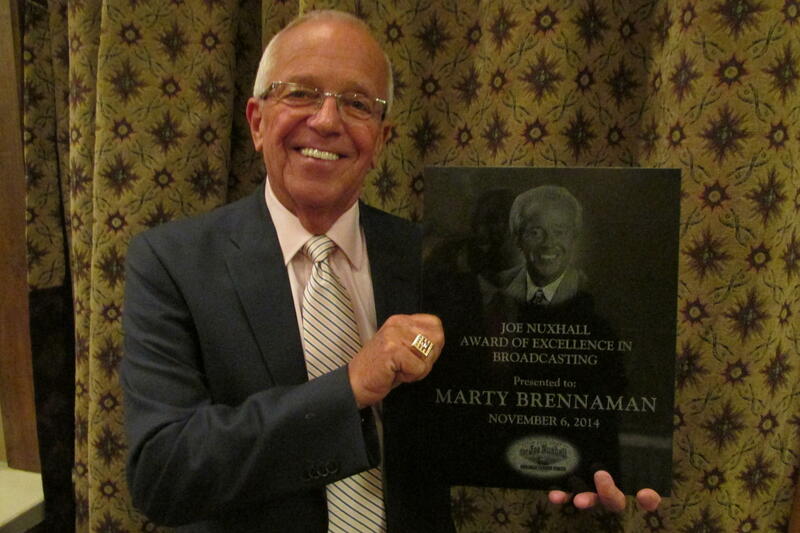 Brennaman was honored at the Joe Nuxhall Miracle League Ball in November 2014. "After a lot of thought, I announced today that after 46 years, after the completion of the 2019 baseball season, I'm retiring as a broadcaster for the Cincinnati Reds. To say that it's been an incredible ride, that's what it's been. "And you folks have had a lot to do with it. You've accepted me as one of your own many years, when I came here in 1974. I feel like I've had a love affair that's gone through four and one-half decades because you all have been so good to me. So I felt like you needed to know from the man himself, and that's me, that nobody can love you as much as I do." In the last several seasons, Brennaman has been working on one-year contracts. Coming back for 2018, he told me in September 2017, "wasn't a hard decision. I still enjoy what I do, so why quit now?" When I asked him the same question last September, after another Reds losing season, he texted me back saying: "No decision yet. Haven't made up my mind." The announcement comes a week shy of the anniversary of being hired by the Reds on Jan. 21, 1974. He was 31 and had no Major League Baseball broadcasting experience. But radio partner Joe Nuxhall taught him the procedures, and "Marty & Joe" on the radio became Cincinnati icons. WLW-AM advertisement for Reds radio in the team's 2001 media guide. "Joe couldn't have been nicer to me," Brennaman told me in 2015. "Years later I realized how much easier it had been with Joe paving the way for me. I didn't know anything about anything. I didn't know the routines. Joe was pre-eminent, among all the people who made it easier for me than it otherwise could have been." They were so well known throughout "Reds Country," the Midwest communities which could hear flagship WLW-AM's booming signal, that they received letters at the stadium from fans simply addressed to "Marty & Joe, Cincinnati, Ohio." "The chemistry between us though is unique. It's really amazing. From the first day, we've always seemed to convey that, one, we were having a good time, and two, that we were having a good time because we genuinely enjoy being with each other," Brennaman told me in 1986, in my first extended conversation with him. Brennaman has often said that his 31-year relationship with Nuxhall meant more to him than being presented the Ford C. Frick Award for baseball broadcasting achievement by the National Baseball Hall of Fame in Cooperstown in 2000. Brennaman recently was named Ohio Sportscaster of the Year for the 17th time. He also won Virginia Sportscaster of the Year four times while broadcasting basketball games for the old American Basketball Association's Virginia Squires and the Norfolk AAA baseball team. "It's awfully nice to work with a living legend, and that's what I've done since 1974. Whatever success I've had, I willingly and gratefully share it with the Old Lefthander, Joe Nuxhall," Brennaman said as the Reds fans cheered Nuxy's name. "I cannot ever begin - I can never begin to repay what he has meant to me. He's been a mentor, and he's also been a very, very wonderful friend. Thank you Joe for so much of the things you've taught me since that first year together. " In recent years, Brennaman has refused to use the word "retire." Speaking to the Hamilton-Fairfield chapter of the Reds Hall of Fame a year ago, he made a reference to "that 'R' word I refuse to talk about." He mentioned it while saying he was proud to have worked for only one Major League team, while most announcers bounced around to several teams. As sad as I am about Brennaman retiring, I'm glad he changed his mind and announced his plans before the season started. In recent years, he had told many people that he wouldn't reveal his retirement until after his last broadcast. Unlike Dodgers announcer Vin Scully, or former Reds Bronson Arroyo or Johnny Bench, he didn't want any long goodbye or farewell tours. “When I walk away, I’ll let them know the day after the season ends," he told me before spring training in 2015. "I don’t want all the (farewell stuff) that goes along with it. I understand they could probably make a lot of money… I’m just not interested in all that stuff. I don’t want to be bothered with it. I don’t need 'a night.' The club and the fans have been good enough to me. I don’t need all that stuff." But we do. Thanks for changing your mind, Marty. As he would say, "And this one belongs to the Reds!" for one last year. Great news at the end of another lousy Reds season: Marty Brennaman will return to the Reds Radio booth for a 45th season in 2018. Brennaman, 75, last year signed just a one-year deal after having multiple-year contracts since 1974. 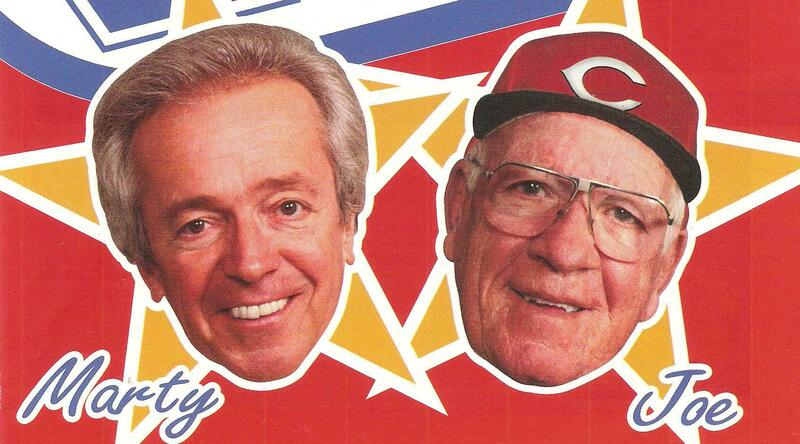 As he celebrates his 73rd birthday today, Marty Brennaman sounds as excited as that rookie big league radio announcer who joined Joe Nuxhall in 1974. That’s what made Marty a Hall of Famer. Reds fans will say he’s best known for his calls of the 1990 World Series, Jay Bruce’s Central Division clinching homer in 2010, or Pete Rose’s hit number 4,192, but to me Marty’s at his best when the Reds are at their worst. Just listen. Marty and Jeff Brantley or Jim Kelch keep fans laughing and engaged through this awful season.